Congratulations on becoming a Certified Candidate for Ordained Ministry! You can be a candidate anywhere from 1 year to 12 years. Seems like a big gap, right? That’s because every person and every call from God takes a unique path. Your time as a candidate is when you will fully explore that path and as a church, we want to make space for this important work. 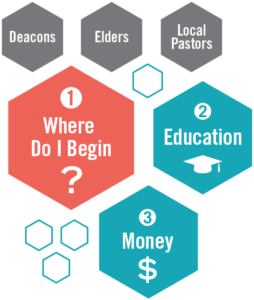 You can serve as a licensed local pastor, if you are interested in this kind of ministry let your District Superintendent know, appointments depend on availability and are not guaranteed but the work of the local pastor is vital to many communities across our connection and some of the most exciting ministry in our conference happens in these churches. Also if you have decided to pursue a Master of Divinity some scholarships are available to you as a certified candidate. Meet regularly with your mentor assigned by your District Superintendent. Together, you two will continue your work of discernment as a certified candidate. If you struggle with your mentor relationship, please contact your District Superintendent for assistance. Every year your mentor should submit a letter of recommendation and information about your progress together to the DCOM chair. Meet annually with your District Committee on Ministry. They will ask you about your continued progress in ministry as a licensed local pastor or your discernment as a certified candidate, or your progress in seminary depending on your path. Pursue a Master of Divinity or other approved degree according to the Order to which you feel called. It is possible to start this prior to an approved Candidate, but not usually recommended because of the cost required. If you are ready to seek ordination as a deacon or elder here are the steps. Submit an Application for Provisional Clergy Membership. Pay attention to the Nov. 1 and Nov. 15 deadlines. Acceptance of your Application and completed paperwork.